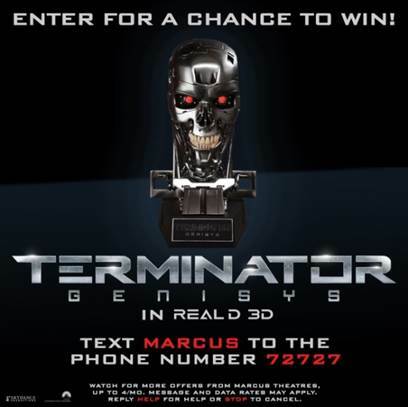 Marcus Theatres contracted with AvidMobile to supply one of our shared short codes for a campaign to give away a replica of the Terminator Genisys head from the actual Studio. Movie buffs were blown away when the replica was actually present in some of the theatres during different stages of the Text2Win contest. All the users had to do was text in the word Marcus to the short code 72727 and they instantly received a response stating that they were entered to win. This marketing plan had two components. The first was to provide a fun interaction between Marcus Theatres and the Terminator fans. The second was to build a database of Movie Buffs that were Sci-Fi fans. The second text message sent to each of the opt-ins stated that they were also opting in to receive future coupons, deals, and savings from Marcus Theatres along with the standard disclaimers. The end result was fantastic. Now Marcus Theatres promoting this in all of their theatres across the nation built thousands of opt-ins. These very specific group of people Marcus theatres knew to be Sci-Fi fans, thus allowing them to send out future Sci-Fi movie trailers, offers for discount tickets, drive Loyalty club sign-ups, offer Popcorn and other incentives to drive additional sales throughout the year. Final results were just as expected. The database proved to be one that when the targeted SMS messages were delivered to the list of opt-ins, the resulting additional transactions provided to Marcus exceeded the ROI anticipated as more than 20% of the databases clicked through to view the trailers and offers, and many came in and redeemed or bought tickets. 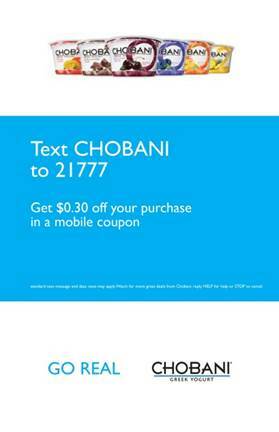 Chobani contracted with AvidMobile to provide mobile SMS engagements from both displays and tablet (kiosk) landing pages at events. Their summer marketing events consisted of taking trailers to festivals, games, and other events to hand-out free samples to people at those events. Their on-site representatives would hand-out the samples and engage with their potential clients to type their mobile number into the tablets or engage from the on-screen displays. When the consumers engages they would then receive an instant SMS message that delivered a coupon for a future purchase as well as drive them with an SMS-embedded link to Twitter. Here they encouraged their potential clients to engage with Twitter and hashtag #Chobani creating a viral element to their event marketing. Multiple components were involved that made these events a success. The investment Chobani made to be at the events was catapulted with the added value of gathering mobile phone numbers for future remarketing via SMS. The initial engagement was linked to Social media garnering tweets that spread the word and consisted of viral free marketing and awareness growth. 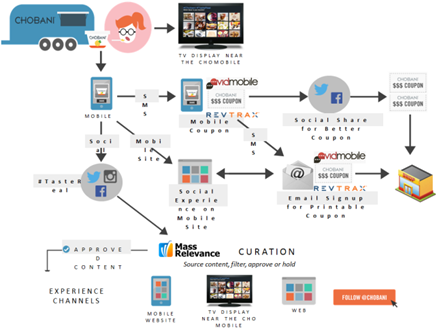 The end results were continued engagement, lead capture and remarketing efforts, and social growth from their events. The immediate coupon engagement allowed for tracking of the mobile coupons as well and proved ROI on the mobile events for Chobani.